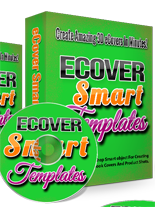 “eCover Smart Templates” is a collection of PSD smart templates that automatically create photo realistic 3D eCovers, all within Photoshop. So if you already have Photoshop, you’re all set… you don’t need any other 3D making software, AND you just need some very basic Photoshop experience. If you sell any kind of intangible products online like ebooks, software, apps, etc.. having a good looking “virtual” cover for your product is a must. A nice 3D eCover adds more perceived value to your product, it makes you stand out from the competition, it makes your product look more professional, it’s great for branding, etc.. This brand new set of premium quality Ecover Smart Templates will help you do just that. And the best part is, you don’t have to be a “techy” person or have any design skills at all. These brand new smart templates will do the job for you. All you need is Adobe Photoshop and a few minutes of free time.